The collaborative duo of Henrik ‘Nordvargr’ Bjorkk and Margaux Renaudin have returned and in building upon 2016’s album ‘Anima Nostra’, that title has now been adopted as the as the moniker for the project’s continuation. Although taking clear cues from the debut (reviewed here), this sophomore album demonstrates a refinement and streamlining of musical approach. While also broadly drawing influence from the multi-faceted approaches of Nordvargr over his career to date, the involvement with Margaux Renaudin allows the music to chart new stylistic territory. Rooted in the post-industrial crossroads of dark ambient, black industrial and neo-classical, ‘Atraments’ is still more varied and complex than those genre tags might suggest. 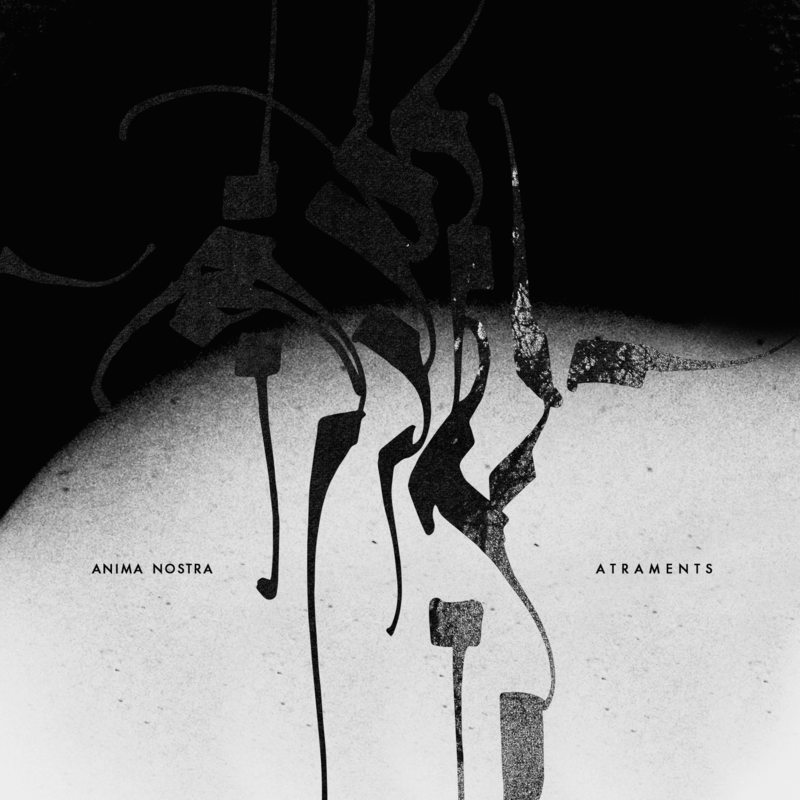 Being musically focused and almost soundtrack in stylistic orientation, Anima Nostra’s compositions are darkly cinematic in scope. Driving martial percussion and slow distorted guitars loom large on selected tracks, which clearly nods to influence from blackened, doom-drone spheres. Yet these ‘band’ instruments are wielded in an heavily abstracted way, where the music never sounds like an actual ‘band’ (…and thankfully avoids any feel of constituting a metal pastiche, or a dreaded industrial/metal hybrid). Further textural variation comes in the ritualised elements such as gongs, chimes, meditative chants, choral chanting samples and treated vocal proclamations, which are combined with shrill strings, drawling brass horns and organ dirges which all woven together into a dense post-industrial sonic tapestry. During a couple of moments a comparison with Trepaneringsritualen comes to mind, particularly given the use of gruff yelled/ sung vocals and rhythmic/ tribal styled framework (…such as is found on ‘Anima Nostra’ and the final cut ‘The Seal’, but within the context of this album the sound is more polished and refined). For further comparative purposes ‘Atraments’ also sits within the same general sonic sphere as late era Mz.412, yet the sound charts its own individualistic direction, with is powerful atmosphere articulating its own form of grim esoteric spirituality. Despite the sheer number of albums Nordvargr has been involved with over the decades, this is yet another album and project which has struck gold, thus making Nordvargr and Margaux Renaudin akin to modern day sonic alchemists. Recommended. This entry was posted in 2017, dark ambient, death industrial, drone, Malignant Records, martial industrial, neo-classical by noisereceptor. Bookmark the permalink.